AQHA JOURNAL - "STOLI THE SHOW"
One money-making horse gives way to another for steer wrestler Matt Reeves. In over a year, Stoli the Show, aka “Roy” has helped six-time Wrangler National Finals Rodeo steer wrestling qualifier Matt Reeves haul in a half-million dollars. And in July, the 10-year old grandson of legendary Frenchmans Guy helped Reeves earn the coveted 2018 Calgary Stampede Champion Steer Wrestling title, not to mention $114,500 Canadian dollars. “As of now Roy has helped me make the biggest part of my best year,” Reeves said. But his Calgary win was bittersweet. The second round offered a challenge with a muddy arena and a steer that hadn’t been caught. After making a long run, Matt looked and noticed Roy was possibly crippled. Immediately examined by a vet, Roy was hauled back to a veterinarian in Texas who treated him for sprained medial and lateral collateral ligaments. Before the Cross Plains, Texas cowboy started rodeoing off of Roy in February of last year, he had been competing on his good horse, French Wonder, aka “Ote.” The 2002 palomino was second in the AQHA-Professional Rodeo Cowboys Association Steer Wrestling Horse of the Year voting in 2013. Matt’s wife, professional barrel racer, Savannah Reeves was turned on to Ote by fellow barrel racer Jordon Briggs when Jordon mentioned the horse had a lot of potential but not as a barrel horse. Interested in Ote’s bloodlines, Matt and his father in-law, Sam Koenig drove to Jordon’s house and jumped steers off Ote for the very first time. In that moment, Matt knew Ote would be something special. Regardless of who rode Ote, they were almost guaranteed to win a check. Professional steer wrestler, Bray Armes knew that no matter where he rode Ote, he would be smiling in the winner’s circle. In 2013, Bray lost his best horse, “Ricky Bobby” so he called Matt and asked Matt if he would mount him on Ote at the upcoming rodeos. Matt agreed. In a short amount of time, Bray went from not winning a dime to cashing in every time he and Ote made a run. By the end of the season, Ote carried Bray to the pay window multiple times. A month before the 2013 NFR, Bray offered to purchase Ote from Matt. They made the deal, and within the 10 rounds of the NFR, Ote helped the two cowboys win approximately $180,000. With the 2014 rodeo season approaching, Marr was in need of another horse. That January, Jordon calle to say she was familiar with another prospect that had speed: a 6-year old out of the great producer Sixes Future by Stoli. The mare sports a whole host of legendary speed horses on her topside like Dash For Cash and Beduino, and revered cow horses on her bottom side, including Doc O’ Lena and Peppy San Badger. Other Sixes Future offspring include barrel racing futurity and derby standout Stoli My Guy (by Traffic Guy) and Frenchmans Future (by Frenchmans Guy), who later went on to win the 2014 Barrel Futurities of America Juvenile Futurity. Matt was immediately excited. The big gelding with a sorrel blazed face had never been in the box and never had any steers tracked on him. But after tracking a few, Matt instantly knew that this horse was meant for him. He bought Stoli the Show that same day. “I wanted him because of the mare, but I also knew what I wanted him to feel like…and he did,” Matt says. Quickly, Matt discovered that Roy was not only birthed from an outstanding mare, but he was sired by a stud who was significant: French Wonder. Yes, Matt’s beloved Ote had been kept a stud and sired 43 colts before he was gelded, which was his status when Matt purchased him years before..
As Matt went down the road in 2014, newbie Roy was his back-up horse. But in September 2016, Matt’s first-string rodeo horse, “Nacho” cut himself in the pasture and Matt was forced to humanely euthanize him. With the 2017 rodeo season approaching, Matt realized he had a 9-year old back-up horse and it was time to see what he could do. Since entering their first rodeo, Roy has helped Matt win more than $550,000 in less than two years’ time while accomplishing many of the Reeves’ family’s goals and dreams. Matt anticipates he and his sorrel horse will be together in the arena again by late September. Since I was nine years old, I use to spend endless hours washing, scrubbing, grooming and polishing my horses and lambs with Mane ‘n Tail to keep them looking sparkly, lustrous and healthy for 4-H shows and rodeos. At a young age, I observed the quality of the product and its’ growth enhancements and quickly began using their shampoo and conditioner on myself. So when Straight Arrow most recently reached out to me and asked if they could send me product for review, I was beside myself. Now I know many of you have also been dedicated users and lovers of Straight Arrow’s products like the Original Mane ‘n Tail or everyone’s favorite, Cowboy Magic. Therefore, I am really excited to share with you a variety of new and exclusive Mane ‘n Tail products that not only can be used on all of your animals, but safe and wonderful for you and everyone you love! 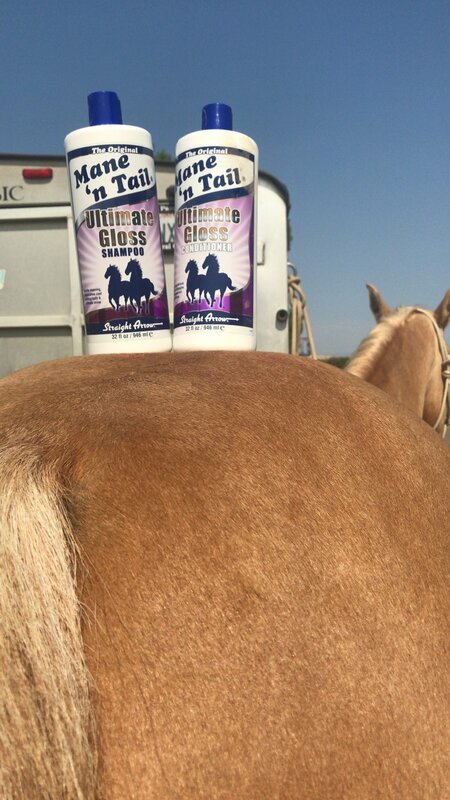 Although I have not used the Ultimate Gloss shampoo and conditioner on myself, it is my favorite go-to for my horses and dogs. With a very mild fruity scent, the shampoo allows for deep lathering and gentle cleansing that targets dirt and stains. The moisturizing formula is pH balanced so it is great for horses and other animals with sensitive skin. After easily rinsing the shampoo out, my animals are left with a super glossy and silky coat. Following up with the conditioner, I am instantly delighted with the softness, smell and finish. After using both the shampoo and conditioner, a long lasting reflective shine literally intensifies and brightens Mo’s palomino color. After using both the products on my Australian Shepherd, Lily, her coat is always left silky and shiny for well over a week. I did notice that if you don’t brush the mane, tail, coat or hair while it is still wet, hair will be very free and lively. For example, Mo has a frail, short forelock and if I do not brush it while it is still wet, it will literally stick straight up. Also, I typically do not need to follow up with a detangler because both the shampoo and conditioner have detangling agents. The Ultimate Gloss shampoo and conditioner is the real deal and if you want to blind others with shine, this product was made for you! I use this Detangler every day on myself and every time I ride my horses. I have really thick hair and many times I get rats’ nests or knots right at my hair line and the back of my neck. I like to spray a generous amount and use a brush (oppose to a comb)to brush it out. I’ve used a ton of different oils and products and this detangler is really the only thing that is effective on my hair. For some reason, my horses like to roll around in bur-clovers or cockleburs and without this detangler, it is nearly impossible to brush out the hundreds of stickers stuck in their forelock, mane and tail. When brushing out these troublemakers, I like to spray a lot of the detangler in the hair and let it soak for a few seconds before smoothly brushing all of the bur-clovers and cockleburs out. The detangler always leaves the hair soft and looking clean even when the animal hasn’t been bathed. Not to mention, it is formulated with natural herbal extracts and is paraben-free, dye-free and aluminum-free. If you want instant, and I mean instant shine on you and your horses’ mane and tail, I highly recommend this finishing spray. Providing maximum shine, the Shine On spray is oil and alcohol free. With a wonderful fragrant smell, this product is long-lasting, repels dirt, eliminates frizz and conditions hair. Combining the Shine On with the Ultimate Gloss shampoo and conditioner, will really turn some heads…you will literally be glittering and shinning! What I found is a little goes a long way and if you have hair that absorbs product quickly, you will need a very small amount to prevent locks from looking greasy. I sprayed the Shine On to my dry hair before a trail ride and left my hair down - I had absolutely no tangles or frizz and my hair looked super healthy and of course, shiny! Mane ‘n Tail contains compounds like collagen, glycol distearate and coconut oil derivatives to rebuild damaged hair, achieve growth, maintain hydration, and keep locks gleaming while never stripping natural oils. The products are affordable, convenient and available at almost any department store. For nearly 40 years, Mane ‘n Tail has continued to evolve and create crossover products that speak for themselves.